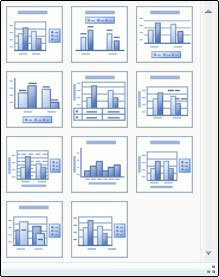 PowerPoint’ Chart Layout galleries offers the most common chart layouts for each PowerPoint chart type. Even if you already have your PowerPoint chart created, you can change its layout by accessing the Chart Layout galleries. 1Click the chart to select it. The Ribbon expands to include three Chart Tools tabs. 2Click the Layout tab on the Ribbon. 3Click the Quick Layout button. This brings up the Chart Layout Gallery. 4Click the layout you want to use.